A biological bomb has just been discovered in the air ducts of a busy suburban mall. At first nobody knows if it's even life threatening, but then the entire complex is quarantined, people start getting sick, supplies start running low, and there's no way out. Among the hundreds of trapped shoppers are four teens. These four different narrators, each with their own stories, must cope in unique, surprising styles, changing in ways they wouldn't have predicted, trying to find solace, safety, and escape at a time when the adults are behaving badly. Dayna Lorentz has an MFA in Creative Writing and Literature from Bennington College. She used to practice law, but is now a full-time writer and part-time cupcake enthusiast. 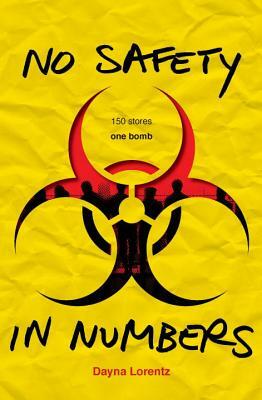 Dayna is the author of the "No Safety in Numbers" trilogy and lives in South Burlington, Vermont with her husband, two children, and two dogs. "Think of the heart-racing chase of The Hunger Games but a giant mall is your arena and everyone is potentially a tribute." "Engrossing...A whopping and disturbing cliffhanger serves as the conclusion. Readers will anxiously await the sequel." "Foreshadowing and vivid staging build a sense of claustrophobia and desperation...readers will eagerly await the next installment."